1. Preheat oven to 200C/390F. Boil a kettle of water. 2. Cut potatoes into wedges (leave skin on). Peel and roughly chop garlic. Add potatoes and garlic to a pot of salted boiling water and boil for 15 minutes or until you can easily pierce potatoes with a fork. Boil another kettle of water. 3. Wash spinach in colander, then point boiling water all over it so it wilts. Rinse in cold water and squeeze excess water out. Chop spinach roughly. Boil another kettle of water. 4. Grate cheddar. Slice spring onions finely. 5. Place fish on baking tray, drizzle with olive oil, and season with pepper. Put tray in oven for 10 minutes or until fish is cooked. 6. Drain potatoes and mash with butter and milk. Add spinach, cheddar, and spring onions and season with salt and pepper to taste. 7. Bring a pot of salted boiling water to a simmer over medium heat. Crack eggs into water and leave for 2 minutes. Transfer them with slotted spoon to kitchen towel. 8. 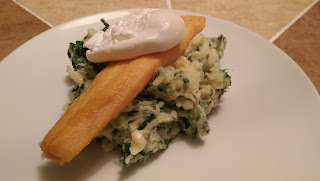 Serve smoked fish over mash with poached egg on top.